Western Digital has announced two new helium-filled hard drives targeting consumer and business NAS applications. 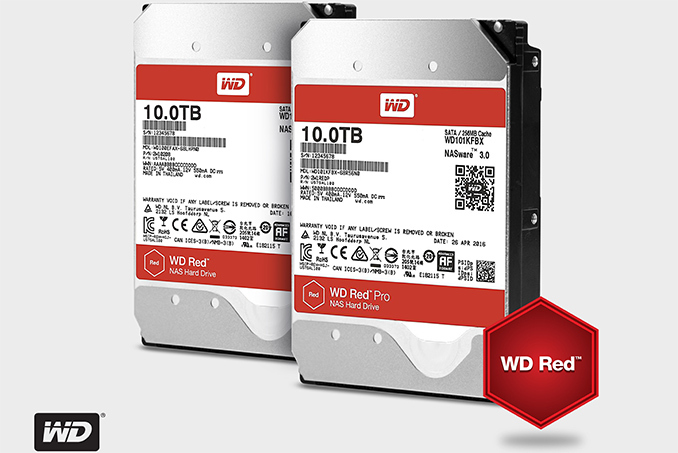 The new WD Red and WD Red Pro HDDs increase capacity of WD’s NAS drives to 10 TB, boost their performance and also reduce their power consumption. Therefore, the new drives enable makers of NAS units to increase capacities of their products to 80 TB (or 160TB) while increasing speeds and cutting down power. After introducing its first hermetically sealed helium-filled NAS and video-surveillance HDDs with 8 TB capacity and six platters last year, Western Digital is refreshing its Red and Purple lineups with more advanced drives offering 10 TB capacity and using seven 1.42 TB platters. The new WD Red and WD Red Pro with 10 TB capacity are based on revamped 5400 RPM and 7200 RPM HelioSeal platforms that can support a higher number of platters. The drives also feature increased areal density and 256 MB of cache, enabling ~17% higher sequential read/write performance compared to its predecessors, as well as a lower power consumption compared to previous-gen helium WD Red hard drives. Other than that, Western Digital does not really disclose the feature set of its platform for helium-filled HDDs for NAS applications. The WD Pro 10 TB drive is engineered for personal or small business NAS systems with up to eight bays, is optimized for mixed workloads and has a 5400 RPM spindle speed. By contrast, the WD Red Pro 10 TB is aimed at medium business and enterprise-class NAS systems up to 16 bays, which is why the HDD features additional protection against vibrations as well as improved random read performance due to both 7200 RPM spindle speed and firmware tuning. Just like their predecessors, the new WD Red/WD Red Pro hard drives come with SATA 6 Gbps interface. It is interesting to note that WD has improved the power consumption of the 10TB drives over the older 8TB drives. We are asking how exactly WD is doing that, as details were not given with the press release. The 10TB WD Red and 10TB WD Red Pro are available in the U.S. from select retailers and distributors. The WD Red 10 TB is covered by a three-year warranty and has a price tag of $494. The more advanced WD Red Pro 10 TB features a five-year warranty and has a $533 MSRP.